The MEP (Mechanical/Electrical/Plumbing) Modeler is an extension to ArchiCAD. Architectural practices and architectural departments of A/E firms using ArchiCAD can use MEP Modeler to create, edit or import 3D MEP networks (ductwork, piping and cable trays) and coordinate them with the ArchiCAD Virtual BuildingTM. Wherever the MEP engineer can provide 3D data, architects can import the consultant’s MEP model into ArchiCAD using the IFC format. In addition to this generic IFC interface, the Modeler package provides an improved connection with BIM MEP applications (such as Revit MEP, AutoCAD MEP, DDS-CAD MEP, MagiCAD etc.). Even if the MEP engineer provides 2D data, the Modeler makes it very easy to model and visualize the MEP systems in 3D and eliminate possible collisions. 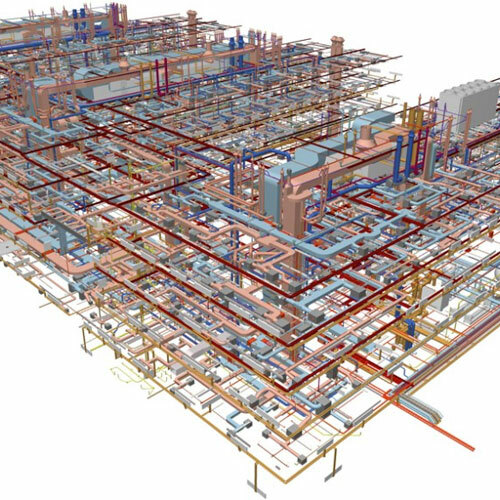 Firms using ArchiCAD can use the Graphisoft MEP Modeler to create and edit 3D MEP networks (pipework, ductwork and cabling). These can be coordinated inside the Building Information Model for great efficiency. The Modeler integrates right into ArchiCAD environment and uses the same familiar interface. Elements are parametric, enabling easy configuration of custom dimensions. An extensive MEP-specific Object Library is part of the package. This library contains specially configured MEP elements with smart connection points for automatic connection during routing of MEP-systems. Upon installation certain standard ArchiCAD Objects (for example plumbing fixtures, kitchen cabinets, heating objects etc.) will be extended with smart connection points and specific MEP-related parameters. Custom MEP elements can be created and saved using standard ArchiCAD tools such as Walls, Slabs, MORPHs and (GDL) Objects. These custom library parts will be automatically added to the current library. They may be placed into the project or re-used in other projects. Custom elements have the same intelligent behavior as the standard MEP library parts. The MEP Systems functionality represents groups of elements that are handled together, which makes element creation and editing much more efficient and consistent. When new elements are added to an existing system, they will automatically take on the appropriate connection parameters: shape, diameter, and width and height values. A basic method of creating a mechanical system is to place individual ducts, pipes or trays one at a time. With this method, connections are built up one-by-one and element positions are adjusted individually at the time of placement. This is a very flexible “LEGO®”-style workflow where you have full control over the type, allocation and parameters of placed elements. In order to modify the geometry of individual elements, a powerful set of graphical editing aids are available. Editing a part of a MEP system will automatically change connected elements. New connector elements may also be added to the system. The Modeler provides a fully automated routine to identify, visualize and resolve conflicts between the architectural design and the engineering design of the MEP networks. Collision detection ensures fast and precise feedback for the architect, and streamlines coordination with the building engineering teams. Collision detection identifies the exact location of discrepancies on the floor plan and the 3D view. All collision entries are automatically added to ArchiCAD’s Mark-Up Tools Palette, providing easy ID access to all collision entries. Designers can quickly evaluate these entries and locate them with a single click. Members of the extended design team can discuss and evaluate alternative solutions, using ArchiCAD’s Mark-Up Tools. MEP systems can be imported into ArchiCAD from standard applications (such as Revit MEP, AutoCAD MEP, DDS-CAD MEP, MagiCAD etc.) via IFC connection. All MEP-type IFC systems with all IFC data are identified and automatically converted to native ArchiCAD (IFC) Systems and intelligent MEP elements. The ability to visualize MEP systems in the complete building environment improves communication between architects, engineers and contractors. Visualization can be done within ArchiCAD using color codes for the various mechanical systems, combined with a wireframe representation of the architectural structure. ArchiCAD’s powerful rendering capabilities can be used to create photo-realistic visualizations of systems for the different trades. ArchiCAD’s extensive export capabilities enable designers to share files in a variety of modeling formats, including the Open BIM supported IFC 2×3. To learn more about streamlining your connection with other disciplines, please visit GRAPHISOFT’s Open BIM page.